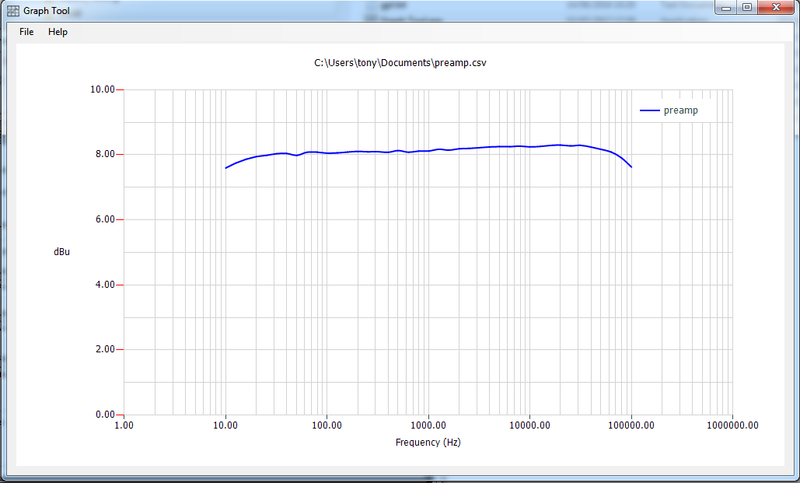 Graphtool - create linear and log graphs from CSV files, aimed at electronics hobbyists. 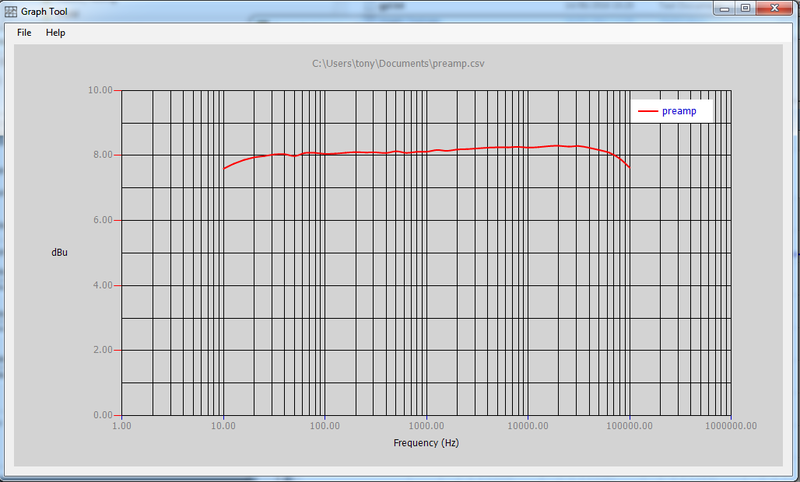 I developed GraphTool to graph the output of frequency response measurements performed using my PicoScope and captured with PicoMeasure. Graphtool can be used for any measurement purposes where only two columns of data are to be measured. ***** NEW ***** version 2.0.0.8 released - fixing a lot of bugs and adding new features. Create logarithmic (default) or linear graphs. 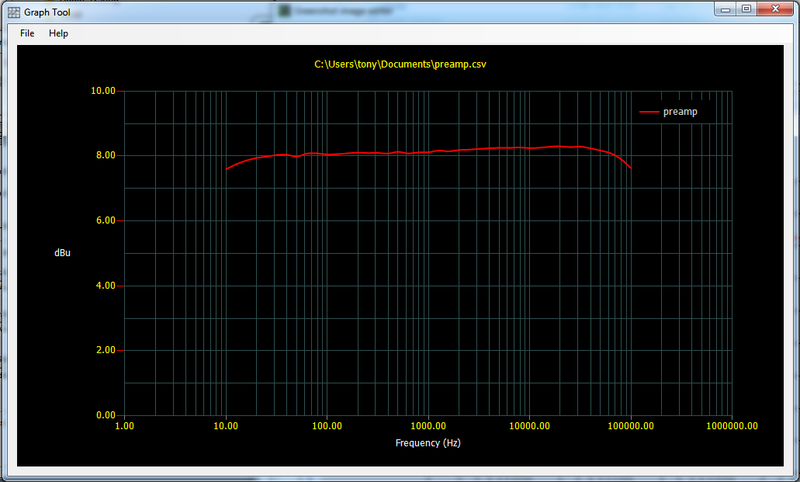 Graph will resize as window size changed. Selectable working folder (users 'My Documents' by default). The first time graph tool is run, you will be presented with the following screen, which informs the user that some defaults have been set. Graphtool screen on first run. 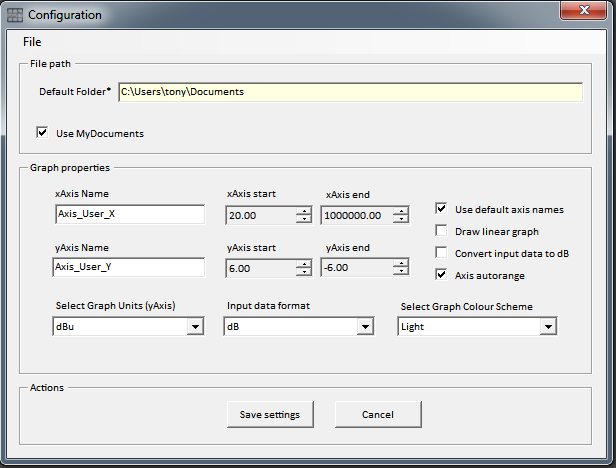 Once Graphtool is loaded, you can simply select a file to graph using the defaults. If you want to change settings, this is detailed below. Click on 'Open' to open a file, click on 'Settings' to open the settings screen. 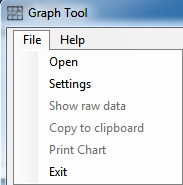 Once a file has been selected, the graph will be automatically drawn. 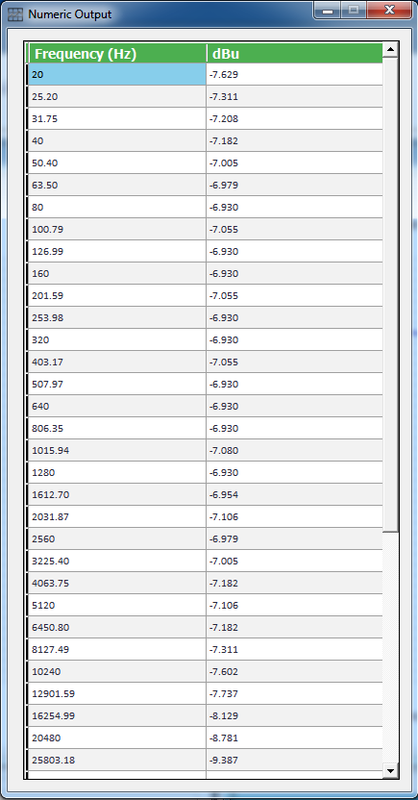 At this point the additional menu options 'Show raw data' and 'Print Chart' will become available. File menu - additonal options now available. 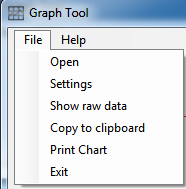 Selecting 'Show raw data' will open another window with a spreadsheet view of the graph data. To perform additional configuration, click on the 'Settings' option in the 'File' menu. This will take you to the settings screen. Here you can define your own Axis names, change the default graph colour, and opt to draw a linear graph (logarithimic is the default). Instead of using 'My Documents' as the default folder, you can click on the 'Use My Documents' option to uncheck it and select your chosen default folder. If you want to draw a linear graph, simply check the 'Draw Linear Graph' box. All changes made here will be saved and restored each time you restart GraphTool. Graph, with the 'Light' colour scheme selected. Graph, with the 'Medium' colour scheme selected. Graph, with the 'Dark' colour scheme selected.